Spheroidal aggregates of crystals of slightly curved faces and edges. 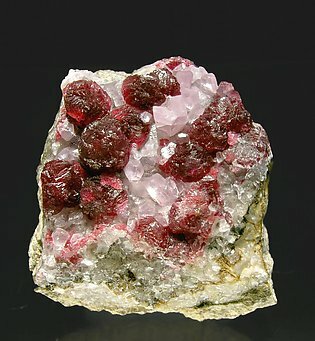 Color and luster are magnificent for the species and contrast on a base of small slightly pink crystals of Calcite, on matrix. We analyzed the specimen and we’ll send a copy of the analysis to the buyer.